Lobe Pump Systems | EGM, LLC. For high flow, high viscosity applications, EGM offers skid-mounted lobe pump feed systems that serve as a rugged means of achieving required capacity for polymer feed units or other process additives. Available in single or multi-pump configurations, the EGM series of Lobe Pump feed systems can be customized to meet client-specific requirements. 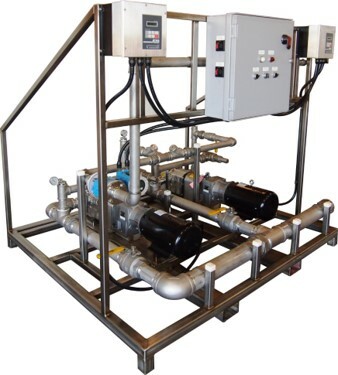 Whether configured for bulk fluid transfer or continuous metering – all systems are constructed with heavy duty bases and frames to allow for rugged mobility and are sized conservatively to keep internal RPM low to extend operating life.